Any effort to engage consumers on healthcare cost, quality and reform issues must start with a robust understanding of their habitual way of thinking about the topic. 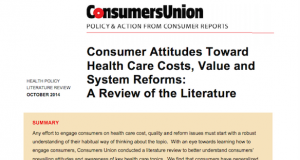 With an eye towards learning how to engage consumers, Consumers Union conducted a literature review to better understand consumers’ prevailing attitudes and awareness of key healthcare topics. Our review details these gaps in consumers’ understanding of how the health system works, as well as areas for additional research that will help complete our picture of how consumers view healthcare costs, quality and delivery reforms. See all our resources on engaging consumers on costs.